Visualization tools startup Palantir announced a follow-on financing round yesterday, raising $90M at a claimed $735M valuation. Since most people aren’t familiar with either finance or VC math, this can generate confusion so I thought I’d do a post explaining a few things. It’s hard to imagine a billion-dollar company without a sales team, but then again Palantir is getting pretty darn close. This is simply not true. By my guess, Palantir is doing somewhere between $25M and $50M in GAAP revenues — nowhere near $1B. Furthermore, while I hate to be technical, I could easily believe they are doing less: as I understand their model, recognizing GAAP revenues should be a nightmare — e.g., calling all field staff engineers and claiming no services business implies field-based R&D implying the need to defer revenues until product completion for a given customer. The second confusion is more subtle and relates to a quirk in VC math that makes an early round investor, who believes in the company and has cash to put to work, valuation neutral on subsequent financing rounds. In fact, you could argue that they’re not valuation neutral, but positively biased because they mark their existing shares to the new valuation when reporting back to their limited partners. Reminder: I am no longer talking about Palantir in specific because their capital structure is both private and presumably more complicated than I describe here. I am trying to show, in general terms, how some quirks result in early-round investors liking higher subsequent-round valuations — even when they’re buying shares at those higher prices. For a quick primer on VC math and terminology, go here. Now, let’s examine a spreadsheet I built to concretely demonstrate the mechanics of what I’m talking about. In my example, a hot company manages to raise a $24M A-round at a pre-money valuation of $36M. This is unattainable for most entrepreneurs, but let’s say you made a lot of money on your last gig and thus have some friends in the venture capital community who believe in you. Note that as part of this round, VC1 has invariably negotiated himself the right to avoid dilution in subsequent rounds. Since he owned 40% of the company after the A-round, he thus has the right to purchase 40% of any new shares sold by the company going forward. This is called exercising his pro rata. In the B-round, the company sells 5M new shares at $6/share for $30M. VC1 chooses to fully exercise his pro rata and thus buys 2M shares for $12M. That leaves 3M shares for the new investor, VC2, who pays $18M. You issue 15M shares at $6/share to get $90M. VC1 exercises his pro rata and buys 6M shares for $36M. VC2 buys 9M shares for $54M. Everybody’s happy, but then you look at founders and employees whose ownership has dropped from 60% before the round to only 40% after. Most people would call this a 33% dilution (20 divided by 60), though some would call it a 20% dilution (60 minus 40). Either way, while this scenario raises the money needed, the team loses a lot of ownership in the process and doesn’t like that one bit. Why sell 15M shares at $6 when we can sell about 4.3M shares at $21 to get the same amount of money? We’re better off, keeping 52% ownership for ourselves, and the great part is VC1 doesn’t care. 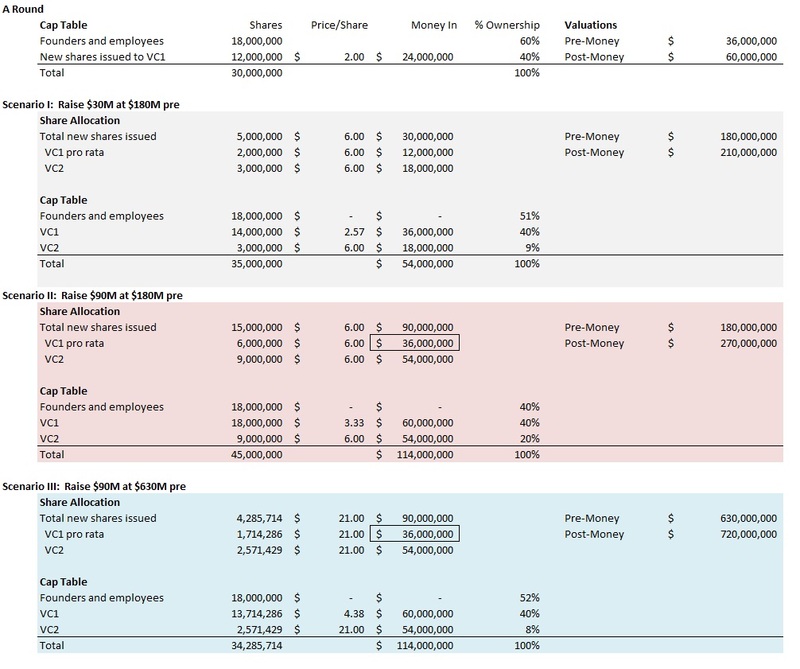 No matter the valuation, if we’re raising $90M and if VC1 is exercising his pro rata, then he’s in for $36M– see the boxed cells on the spreadsheet. All we need to do is to get together with VC1 and find some dumb money willing to pay $54M for 8% of the company. There’s plenty of dumb money out there these days and if we can’t get it in one investor, then maybe we can build a little consortium of a few. And while we might view VC1 as valuation-neutral from one perspective, we shouldn’t forget that he has a boss, too. He reports back a few times / year to his limited partners. If we do the deal at $630M pre-money, then he can mark up his A-round shares from $24M to $252M in value, showing a 10x paper return to his investors. I am not saying this has or has not happened with any given company. I would like to make the important note that the whole notion of “dumb money” is at odds with free market theory. I’ll also add that I know some quality VCs advise limited partners to ignore investment marks-to-market, but I doubt they all do. Nevertheless, I hope this story shows that there’s potentially more than meets the eye in the world of venture financing, driven largely by the dual role (owner and seller) played by the existing VCs and founders/employees. The company is trying to build and/or sustain a hype bubble and wants to be seen as hot. Most VC-backed companies do not disclose valuations. The company is executing a “go big or go home” strategy that I’d argue increases the risk for its customers. Remember, Amazon went big. Webvan went home. See the Fit or Fat Startup Debate launched by Ben Horowitz and countered by Fred Wilson for an examination of such strategies from the VC point of view. In my estimation, sometimes they produce a great result, often a great crater, and rarely a great business. Ironically, you can get nice exit valuations off such strategies but not great multiples. The company has a supportive A-round investor willing to invest real money and who believes in the go-big strategy. The company intends to spend the money, either because it must in order to sustain the current burn rate or because it wishes to expand into other areas. The former signals unsustainable situation, the latter signals a potential loss of focus. If things don’t go as the company plans, the dumb-money will put constant pressure on management to be aggressive, reminding everyone of the expectations they bought into. This can make it hard to back off and change direction in the event of bumps along the way. This entry was posted in Palantir, Venture Capital. Bookmark the permalink. Nice job of explaining how VC math works. You just have a different understanding of a “1 billion dollar company”. For TC it’s a company that’s valued at more than $1b and for you it’s based just on revenues. That doesn’t mean they’re confusing revenues with valuation, just that they refer to a $1b company when it’s valued so. Other than that, the article is fascinating. The “valuation neutral” theme is very important and very seldon spoken about, thanks for reminding us about it. Pingback: The Park Paradigm - On liquidity. Thanks Stefano. While I usually am quite open to questions of definition, in this case I’m not. In enterprise software, where I’ve spent 20+ years the standard meaning of size-X company is revenue. The only time period I can recall when some companies talked about market cap instead of revenue was, guess when, 1999-2000, during the Internet bubble. To me, it’s not definitional. Just plain old misleading. Doe you know how many outstanding options they have? If someone was offered 75k in options, would that be a good deal to make millions on the back end? I have no idea, but you have hit on good point. Getting award stock options without knowing the fully-diluted shares outstanding is like getting told the amount of your salary, but not the currency — i.e., we’ll pay you 100K. 100K what? Yen? Dollars? Euros? Rupees? So 75K stock options is basically meaningless. You need to know out of how many. Companies who decline to say are usually hiding something. I really enjoy learning more about the equity side of the high-tech world. Why would a company doing so well take on an additional 90 Mill? I think this the 3rd or 4th round…Must be veru diluted by now. The question is on what basis are you deciding that they are doing well? Big events? Fancy offices? Lots of employees? … all those things cost money. While I’m not sure about Palantir, the go big or go home strategy basically entails creating an illusion of a successful business by effectively buying revenue at up to 100% of more losses — e.g., I’m told that Exalead did around $20M in revenues but with $20M in losses — roughly speaking that cost s$20M/year … hence if you want to keep that sort of thing going you need to raise money and lots. Main point: “doing well” is largely about perception that can be bought. Actually doing well, imho, entails creating a sustainable business. There’s a saying; revenue equals vanity, EBIT equals sanity. Perhaps this would be fitting here given the rounds of capital raisings that they’ve had. Thanks Vic, I did see that this morning. I’m a student and the equity side is quite new to me. How can I calculate the pre-money valuation of a company after the first round but before the next one? Does the IRR differ to new investors or does the company offer always the same IRR (e.g. 35%)?